When did Christianity become risk management? We seem to value excellence over weakness. Jesus doesn't want to be a part of anything we can do without Him. It's not about the provision, but about the Provider. When we miss this, we miss out on what He is doing. Jesus isn't a magician, He is the Messiah. How do we pass on a love for the Word of God to the next generation? Change their "should" to "want to". Until "should" turns to "want to" consistency will be the problem. Our brains learn best in the context of story through the process of repetition. Christian education is how we organize and educate the church so it can grow. Spiritual formation is celebrating a person's personal spiritual journey. We need a combination of both. We need to move people from "what" to "why". Let the truth of God overtake your facts. We consistently mistake God's embrace for His endorsement. You can be used of God and still have the wrong motives. Before we can talk about the peace of God, we have to talk about the pace of God. We aren't forsaking our responsibilities when we rest. It for the the sake of those responsibilities that we rest. Family ministry is more than a program. 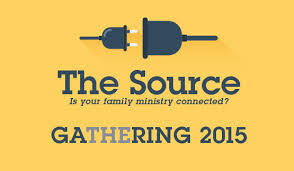 Programs won't reach today's families, only an encounter with the gospel will. As we pursue Jesus we get the abundant life. When we strive for the abundant life we get dysfunction. It was good to talk to Trevor Lee, Mark Holman, and Ryan Frank. These are good guys who have been and continue to be an encouragement to me and my ministry.